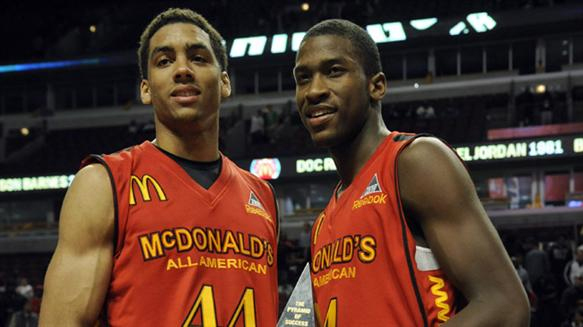 The McDonald’s High School All-American game is annually one of the best games for all basketball fans because it offers a window to the future of the sport. — Michael Gilchrist (St. Patrick HS, New Jersey) and James McAdoo (Norfolk Christian, Virginia) were named co-MVPs without doing anything spectacular. However, both were very solid and should help out their future teams. Gilchrist, who had 16 points and 12 rebounds, should immediately become Kentucky’s best on-the-ball defender and will won’t need any set plays to get his points. McAdoo, the nephew of former North Carolina great Bob McAdoo, plays with great efficiency and should fit perfectly in Roy Williams’ system at UNC. — Duke University-bound guard Austin Rivers (Winter Park HS, Florida) was looking very ordinary until he made that gorgeous NBA-like move when he blew by a couple of defenders with a vicious crossover dribble and then finished in style at the rim with a reverse layup. That one play alone showed why Rivers – who is the son of Celtics coach Doc Rivers – is the No. 1-rated high school player in the United States. — Brad Beal (Chaminade College Prep, Missouri) is a scorer. The 6-5 shooting guard went right at Rivers early on and wasn’t afraid to go head-to-head against the best. He should fill up the scoreboard for Billy Donovan at the University of Florida. — Myck Kabongo (Findlay Prep, Nevada) is a blur. The 6-1 point guard from Las Vegas has two gears: fast and superfast. He has the best handles in his class and has the look of a floor general. The University of Texas has a gem in its hands. — Speaking of point guards, Quinn Cook (Oak Hill Academy, Virginia) and Marquis Teague (Pike HS, Indiana) entered the contest with a ton of hype, but both were somewhat disappointing. Cook didn’t really do much in the game and appears much shorter than his listed height of 6 feet. Teague is regarded as the top point guard in the United States, but he was shaky offensively and made too many mistakes. — Indiana University has been looking for the next big Hoosier star and lead IU back to prominence and Tom Crean may have found his savior in 6-10 center Cody Zeller (Washington HS, Indiana). Zeller is a natural post player who can alter a game on both ends of the court. He also runs the floor extremely well for a big guy and is a solid rebounder. — Pittsburgh normally doesn’t get many McDonald’s All-Americans, but head coach Jamie Dixon has a good one in 6-9 center Khem Birch (Notre Dame Prep, Massachusetts). Birch had 15 points, 10 rebounds and six blocks. And about the only thing he did wrong during the game was wearing those hideous long-sleeve undershirt. C’mon, Khem. It wasn’t that cold inside the United Center. — Zeller and Birch are head and shoulders better than Duke-bound center Marshall Plumlee (Christ School, North Carolina), who is a little soft and barely made an imprint in the game. — Anthony Davis (Perspectives Charter, Illinois) has the highest ceiling among all the players in the game. He reportedly grew 6 inches in 12 months and went from a guard to a forward. The Kentucky-bound Davis is long and plays very fluid. When he gets more comfortable with his size, he’ll be dynamite. John Calipari has another outstanding freshman class coming to Lexington, and Davis is at the top of that class. Simply want to say your article is as astonishing. The clarity in your post is simply excellent and i can suppose you’re a professional in this subject. Well with your permission let me to grasp your feed to keep up to date with impending post. Thank you a million and please carry on the enjoyable work.